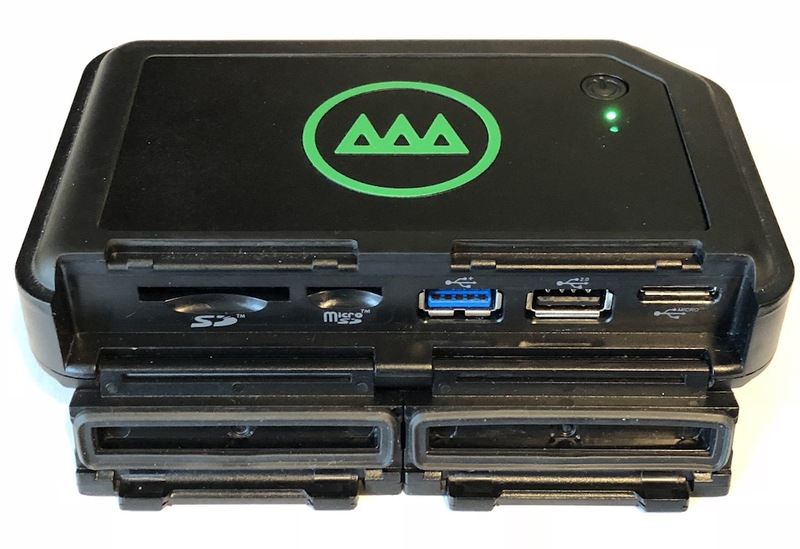 Gnarbox (gnarly name, dude) is a portable solid state hard drive (SSD) that connects to your mobile device via its own local WiFi hotspot. This means you can use it with mobile devices that do not support USB drives, like the iPad. I got my hands on a Gnarbox from B&H Photo to test, and what follows is my experience with it using iOS mobile devices. Connecting to the Gnarbox is a two-step process. After powering up the Gnarbox, it starts broadcasting its WiFi SSID. You must manually connect your mobile device’s WiFi to the Gnarbox network. You can then use the Gnarbox App (available for iOS and Android) on your mobile device to browse images and other files in its directory structure. 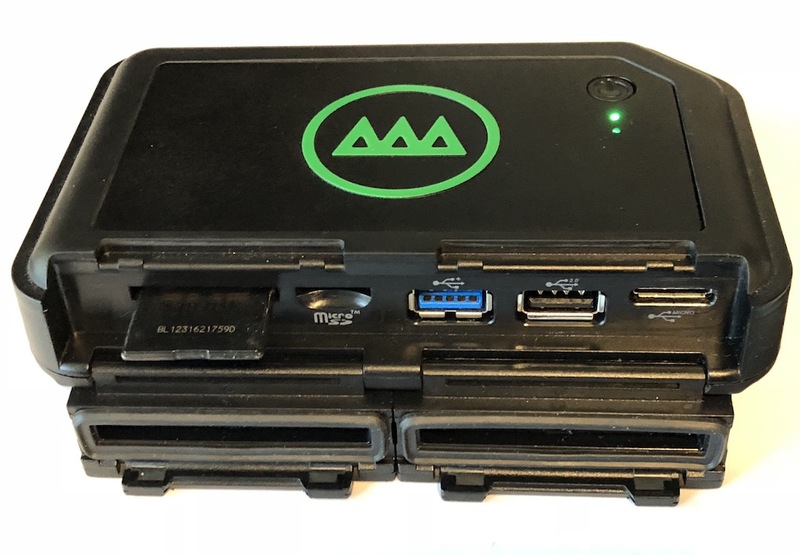 Gnarbox supports up to 4 simultaneous WiFi connections, so you can use it with others in the field. The Gnarbox App allows you to browse, copy, and edit images via a mobile device. Copy images to the Gnarbox using either of the built-in memory card slots or with a card reader in either of the Type A USB ports. There is no “automatic” download option, so you must be sure to connect the Gnarbox to your mobile device before downloading images to it. If speed is your thing, you’ll definitely want to transfer images using a fast USB 3 card reader via the blue USB 3 type A port on the Gnarbox. The built-in SD card slots do not support the faster transfer rates that you can get with some card/reader combos. You can also move images from your mobile device to the Gnarbox, but the process (at least in iOS) is a bit cumbersome. Gnarbox does not access the iOS camera roll directly. Instead, you can copy images from your Photos App to the Gnarbox via the “Share” function. 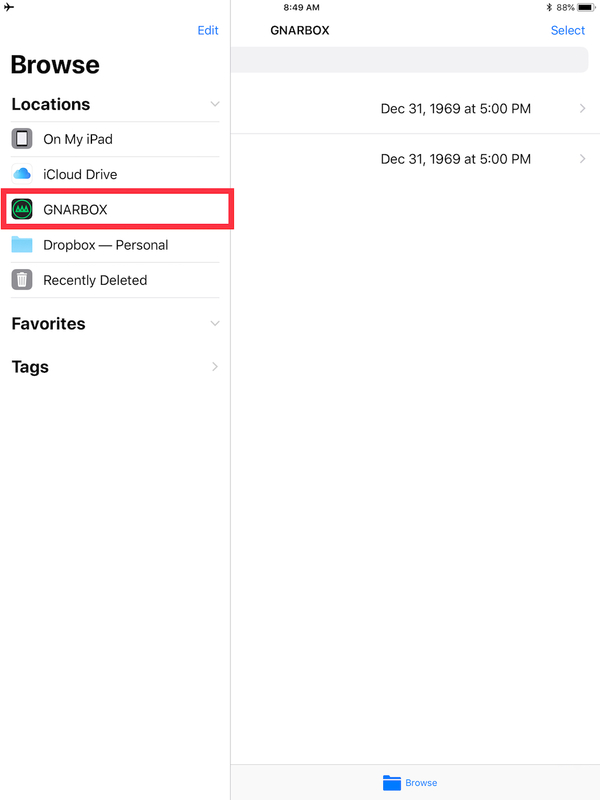 Gnarbox integrates with the Files App in iOS 11. Gnarbox integrates with the iOS 11 Files App, and from there you can copy the images to the Gnarbox directory. Currently, one cannot create a new folder from the Files App, but the images are placed into a dated folder in the Gnarbox directory structure. The entire process is a bit cumbersome if you’re trying to transfer images from your tablet to the Gnarbox; my guess is that most of these limitations are driven by the fact that the Files App for iOS is still in its infancy. The Gnarbox is available in either 128 or 256GB configurations. That’s not a lot of storage for someone spending a week or more in the field shooting RAW images or videos. Fortunately, you can connect a bus-powered USB hard drive to the Gnarbox via eitherUSB type A port. I was able to successfully connect both a LaCie Rugged 2TB drive and a 2TB Western Digital MyPassport Ultra to the Gnarbox and copy files to them quickly. Using the USB 3 type B port, you can connect your Gnarbox to a computer to browse its contents. In order to do this, you must first chance the Gnarbox to Mass Storage mode in its preferences. The Gnarbox then mounts directly to your computer via USB. You can import images to your Lightroom CC catalog directly from Gnarbox using the Files App. One feature that I really liked about the Gnarbox portable hard drive is that because it is compatible with the iOS Files App, you can browse and import images from the Gnarbox (plus any other connected drives) directly from the Lightroom CC (mobile) App. 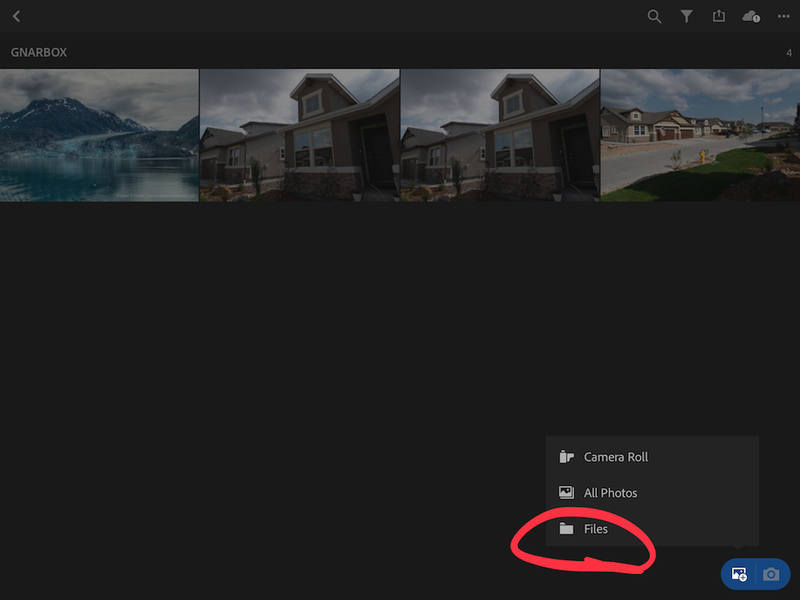 Simply choose the “Files” option from the Lightroom CC import menu (add photos), and navigate to the Gnarbox directory. Transfer is fairly quick, as Gnarbox uses a fairly robust WiFi broadcast. In the Gnarbox App, you’ll find a special folder called “Favorites” that is essentially a virtual folder. When browsing images in the Gnarbox App, you can mark any file as a favorite with the star icon. These images will then show up in the “All Favorites” in the Gnarbox directory in the iOS Files App. Marking favorites is a great way to perform image triage on the Gnarbox before copying files to your mobile device. The Gnarbox App also includes a basic RAW editor. In Edit mode, you can adjust exposure, color, contrast, temperature and more. 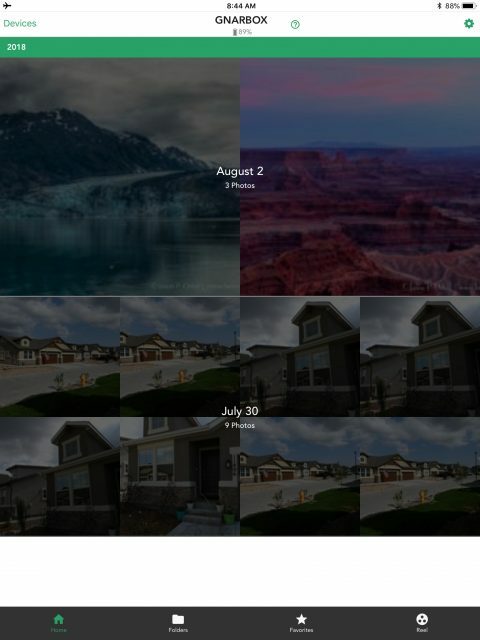 When you edit an image, you can then export a JPEG copy of it to either the Gnarbox directory (in a dated folder) or to the camera roll on your mobile device. Most of the features I’ve described so far are very favorable for traveling photographers who need a portable storage system that works with a tablet or smartphone. However, there are some features and limitations that I find particularly challenging. The Gnarbox battery is rated for 4-6 hours of use. No biggie, when you think about it. But the devil is in the details, and herein lies a major design flaw: You cannot transfer files or connect an external drive to the Gnarbox when it is connected to a power source. Yes, you read that correctly. The circuitry of the the Gnarbox is such that when you are transferring images (even over WiFi) or powering an external drive, you risk a brownout when connected to external power. This single issue may be my biggest grievance with the Gnarbox portable hard drive. Ideally, I’d like to use the device with external power (such as when I’m in a hotel) and then save the battery for the field when power isn’t available. I have an OWC Envoy Pro enclosure that is home to a 500GB SSD. When I connected it to the Gnarbox, it powered up but wasn’t recognized by the Gnarbox App, rendering it useless. Hopefully, support for this drive enclosure will be introduced in a future firmware update. In an earlier version of the software, my Gnarbox failed to generate thumbnails from my Nikon D750 RAW files. That issue was corrected with the latest App/firmware release. When you connect to the Gnarbox, you must use it’s WiFi network. Unfortunately, Gnarbox does not have a “pass-through” feature to enable Internet connectivity from another WiFi network. Unless your mobile device has a cellular data plan, you can’t connect to the Internet while using the Gnarbox. The Gnarbox portable hard drive is currently only available as 128 or 256GB configurations. That’s not a lot of storage given the price-point. For the same price as a 256GB Gnarbox, you can pick up a 1TB portable SSD. Of course, stand-alone drives won’t interface with your mobile devices, but either way, Gnarbox is expensive. 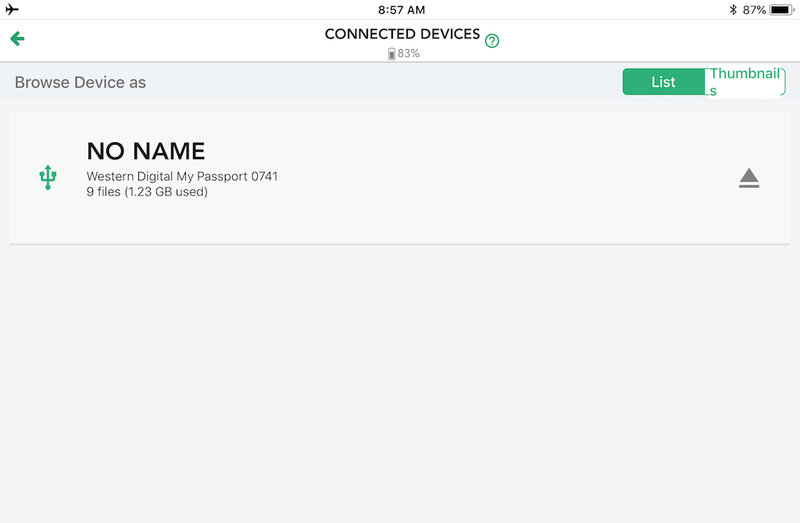 Currently, you must connect your Gnarbox to a mobile device in order to transfer images from a memory card. For field backups, I’d really prefer a direct/automatic download feature. All of the ports on Gnarbox are upside-down! Okay, this feature is merely an annoyance with me, but when you have the Gnarbox opened, the ports provide a nice little stand. However, all of the USB and even the SD ports are UPSIDE DOWN. That’s just poor design, in my opinion. Most electronics warm up during use, but I’ve found that the Gnarbox sometimes gets really hot to the touch. I’m skeptical about using the Gnarbox for extended periods in hot conditions. One never knows what happens to electronics at high temperatures. When I first read the specs for Gnarbox portable hard drive, I was very excited to incorporate it into my iPad Pro based mobile workflow. On paper, it provides almost exactly what a traveling photographer needs: backup, image browsing, and fast interface ports. Unfortunately, the current version of Gnarbox has some serious design limitations that makes me reluctant to recommend it. The small drive capacity, coupled with the inability to use it while it is connected to external power, is a serious drawback. I don’t want to run out of storage in the field, and connecting a second external drive is not my idea of traveling light. I’d be all over a 500GB or 1TB version of Gnarbox that allowed me to use it while powered and connect to the Internet via my at-home or hotel WiFi. On a positive note, Gnarbox is currently developing a second-generation version of the product that will support up to 1TB of storage and includes a USB C (Thunderbolt 3) interface and has direct card transfer support. Disclosure: I received a complementary test unit from Gnarbox in exchange for an unbiased product review.